I wonder how many of you dear readers remember Audio Analogue's early days. Everything started with a small integrated amplifier, the famous Puccini and, did you know that?, a DAC!, the Vivaldi. Since then a doubt has been twisting my mind: what does "Audio Analogue" exactly mean? It seems an English transliteration for "Suono Analogico" but, then, the correct translation should have been "Analogue Audio" and not viceversa. Something to do with analogue? In which sense? The brand new Italian firm wasn't making nor designing components devoted to analogue playback of sorts. No turntables, no tonearms, cartridges or...phono preamps! Instead, they were making a DAC!!! OK, I admit there was a small, quite good, built-in phono stage inside their Puccini's but that was all. All. Time was come to put a patch to this "bug". 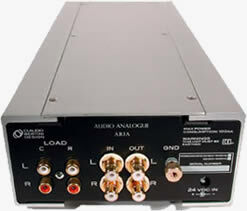 Here is their first really "analogue" component, the Aria phono preamp. Soon a tonearm (kinda modded Rega) and a revolutionary turntable, with built-in adjustable VTA (!!! ), will be released. Aria, in italian, means "Air" and, incidentally (!!) is also an anagram for RIAA, the vinyl equalization curve. Before I start, let me confess publicly the loan of this component has been one of the longest of my HiFi reviewer's career. Some troubles and upgrades to my analogue front-end caused a sad, unexpected delay. Audio Analogue guys patience seems to tend to infinity. My mostly heartfelt apologies, dudes. The A.A. 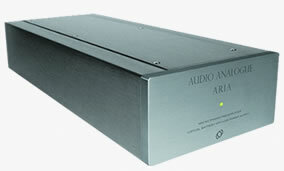 Aria is a solid state MM/MC phono preamp, designed by Marco Manunta, featuring an outboard power supply. The cabinet is a stylish anodized aluminium box while the external PSU is nothing else than a diminutive transformer as those used on cell phones or similar devices. Definitely NOT the usual transformer one expects to find in products of this price range. Don't be fooled by the looks, though. Actually, the Aria makes use of a sophisticated off-line virtual battery power supply. The outboard transformer serves only to "charge" a set of caps (yeah, no batteries!). The preamp circuits remain "off-line", fed by the caps. Once the caps charge drops, the Aria switches to a second set of caps which were connected to the mains and "charging" in the meanwhile. This way the preamp circuits are NEVER connected to the mains, hence avoiding spikes, interferences, EMI's or RFI's, hum etc. Think at this solution as a double set of rechargeable batteries: once the charge of the first set drops, the second set kicks in automatically, while the first set gets connected to the mains again. And so on ad libitum. A third set of caps serves as back-up charge while switching from one set of caps to the other. As said, the Aria is user-configurable in many ways. First of all, you can adjust the gain of the MC stage, by soldering appropriate (and supplied) resistors on the circuit. This operation is better to be left to authorized dealers, though. Secondly, you can adjust input capacitance (100, 220, 330 pF) and MC load (100, 150, 180, 220, 330, 470 Ohm). Default settings are as follows: 47 kOhm and 100 pF both for the MM and the MC stage (the owner's manual reports a mistake: 100 Ohm for MC). Voltage gain is 40 dB in MM and user-adjustable between 62.5 and 71.5 dB for MC. Input load and capacitance can be adjusted by means of special RCA connectors (with built-in resistors or caps) to be inserted into the "LOAD" RCA females on the rear panel. These RCA connectors are color-coded and are kindly supplied with the main unit. Also available a set of "blank" RCA connectors for extreme personalization of the load/capacitance values. Official tech specs claim a conservative 76 dB S/N ratio for the MM input and a very good 72 dB for the MC input. Frequency response extends from 20 to 20 kHz within a ± 0.5 dB range. The whole unit weighs around 2.6 kgs (5 lbs) and is 15 cm wide, 7.5 cm tall and 37.5 cm deep. I've tested the Aria under different situations, comparing it to various external phono preamps (for example, to the similarly priced Lehmann Black Cube SE + PWX) and good internal phono stages (e.g. latest release Naim Audio NA-323 boards with Russ Andrews PowerPack III PSU). There's no doubt this phono preamp possesses the usual Audio Analogue family feeling, that peculiar kind of sound that has made the Italian brand famous and well respected worldwide. This means the unit has been designed also "by ear", in order to achieve designer's goals in terms of sound. After the first minutes there are two aspects that catch the ear: fluidity and smoothness. The sound of this phono preamp is graceful and airy, delicate, almost fragile in the mid-high range. Voices, for example, are clean and smooth so much that it seems the Aria trades in presence for fluidity. When mistracking occours even phono preamps can play a significant role. Among others, there'a disc I often use to test a vinyl playback system (including phono preamps!). Nothing audiophile, perhaps nothing a Music lover would call a masterpiece but still very useful for my goals: "Through the barricades" by Spandau Ballet (CBS 450259 - 1987 - Holland pressing). The last track (i.e. the one closer to the LP label) is the title-track "Through the barricades". To make things worse, Tony Hadley's voice has a particular reverb on sibilants. Hence, when he sings "..through...the barricadeS.." that S sounds unbearable when played with poorly aligned carts or cheap phono stages. One might be led to think it's a problem of mistracking alone. Certainly those damned inner grooves play a role but even a bad phono preamp might add distortion and roughness. With the Aria one can distinctly perceive the natural "human" S and THEN the added electronic effect. I'm not saying the Aria makes sibilants more bearable (just a little bit...) but certainly it makes non-audiophle pressing less ear-splitting. Other phono preamps, more devoted to transparency and introspection, show no mercy with recordings' faults. This attitude might classify the Audio Analogue Aria as "laid-back" sounding. A bit so. Certainly it is not aggressive and, on certain recordings, some extra "physical" involvement would be more than welcomed. Anyway, it is "emotionally" involving. Just let me cite two examples that should clarify the difference. While in "Mary's prayer" (Danny Wilson, album "Meet Danny Wilson" 1-90596 Virgin Records - 1987 - USA pressing) the emotion brings to tears, in "Six blades knife" (Dire Straits - 1st album - 800 051-1 Vertigo 1978 - Italy pressing) the Aria lacks that "kick" needed by the muscular bass & drums section. Also, Mark Knopfler's voice appears less aggressive than it should be. Since I've started writing something about the bass range, let's elaborate the concept a little bit further. While the Aria is very good in terms of articulation and depth it somehow lacks "slam" and impact. With highly demanding musical genres this may become unwelcomed by many listeners. It is rather a "choice" made by the designer, in order to preserve the gentle and "controlled" behaviour of this phono preamp. If you don't mind, I'd say this attitude reminds me the Audio Analogue Puccini integrated amplifier, provided we all agree we are talking of two very different "classes" here: budget-class for the Puccini, mid-to-high class for the Aria. Don't get me wrong, you can still play everything you like with the Aria! Only, bass-and-punch freaks may find the Aria way too "well-educated". It performs at its best with jazz, classical Music (even symphonic pieces) and acoustic Music. Here the Aria can really shine, gently offering its smooth touch to the musical experience. Overall, the Aria is a component very easy to live with, you'll soon forget you're trying to understand the way it sounds. It tends to disappear and lets you concentrate on your favourite LPs. Even the worst-sounding ones! Yes, this phono preamp can let you tolerate bad recordings for longer. This is certainly due to the very low level of distortion and to its peculiar "balance". The mild-mannered approach of the Aria becomes more and more evident as you concentrate on overall dynamics. It does never sound aggressive or harsh, always being smooth and relaxed: I'd rather not call this "compression"...no, it is just a natural inclination of this unit. Compression is normally associated to distortion. When a given HiFi component - amp or loudspeaker - can't cope with the dynamic demands of the musical program, you normally experience compression and, thus, distortion and a rather harsh sound. Simply put, the Aria doesn't yell to impress and that's all. This attitude is far more evident in the bass and mid ranges where you may get less "slam" and punch than required. Just to state things clearer, the similarly-priced Lehmann Black Cube SE PWX beats the Aria hands down, in terms of sheer energy and overall dynamics. This is quite natural, considering the two preamps have very different goals in mind (does a preamp have a mind? It has now). Switching to Classical Music, one can't avoid to test pure dynamics with the king of all instrument, the piano. Among other recordings, I've choosen a real masterpiece, at least from a purely technical point of view: Prokofiev's "Sixth Piano Sonatas" played (and recorded) by James Boyk, with the aid of some well known guy from Sheffield Labs (Performance Recordings PR-3 - 1982). This recording is a reference among piano recordings: clarity, image and dynamics at their best. With the Audio Analogue Aria the legato parts are finely reproduced while the tonal balance is correct. Overall dynamics and left-hand most dramatic parts may deserve more energy and impact, though. While testing dynamics on human voices I've come across one of my favourite singers: Diane Schurr. On "Pure Schurr" (1991, GRP - GR9628 - USA pressing) there are tracks that are highly demanding in terms of dynamics. If you know the way Diane sings, you understand what I mean. Well, the Aria, especially during the most intense acuti, seems to cut the highest frequencies and relax (read: sit down) a little bit. It rolls off the extremes, it does not even attempt to follow the whole dynamic variation. In the microdynamics department things are much better, as this unit succeeds to preserve the whole harmonic content of the instruments. Also, though not exactly hyper-detailed, it still unveils many details, which are necessary for a proper performance in terms of microdynamics. The depth of the soundstage is one of the things I've liked most. Indeed, the Aria succeeds building a deep soundstage behind the speakers and also in front of them. This, during a casual listening test, may lead to the wrong conclusion this preamp tends to sound "forward". Not so! There's life in front of the speakers...but there's also air behind them! Forward-sounding HiFi components tend to move the whole stage in front of the speakers, leaving almost nothing behind. If you have had the feeling of a "forward" sound, please listen again carefully. The width of the stage is not as good as its depth. Actually I prefer a wider stage with more "air" among the instruments. From time to time, I've had the unpleasant sensation of a narrow stage, completely condensed at the center of the scene. The height of the image is very good and so are the focus and the stability of players' and singers' contours and bodies. The owner's manual suggests 100 hours of break-in and 40 minutes of warm-up before critical listening. I can second those figures though you shouldn't take them as gospel: the Aria sounds quite good even after a couple of minutes. No big deal, it has no power on/off switch, so it should remain always connected to the mains. The mains transformer and the main unit should be kept as far as possible from each other, to minimize interferences. For the same reason, take care to keep the main unit far from mains cables or power supply transformers. Do not place the main unit over an amplifier, for example. The stock feet have absolutely no damping action so you may need experimenting different solutions. In my opinion, soft damping feet like the BrightStar Isonodes are the way to go. Manufacturing and finish. The Audio Analogue Aria is well built and finished. The aluminium cabinet has round edges so to be children-friendly. The external transformer looks very poor and makes use of a detachable figure-8 mains cable of very poor quality. A detachable power cord (with IEC socket!) should be mandatory for products that aim to be considered "high end". Perhaps a better power cord would be useless, considering the virtual battery operation, but perceived quality plays a key-role for the success of a product. That aside, my main complaint refers to the way "user personalization" has been achieved. 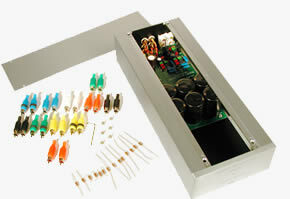 First of all, the color-coded RCA connectors system is less intuitive than a microswitch-operated system. The quality of the connectors is VERY POOR, imagine the cheapest plastic RCA connectors you've ever come across and you're quite close (have a look at the pic!). Again "perceived quality" gets lost!!! What's worse is that Audio Analogue recommends using gold plated RCA connectors with gold plated RCA females. I couldn't agree more, as mixing materials when dealing with electrical contacts is a no-no but, then, WHY the supplied RCA connectors are NOT gold plated? I'm not necessarily a fan of gold plated connectors BUT!!! You can't suggest a procedure and then make it impossible to apply! Also, the system adds contacts (even of poor quality) into the signal pattern and even using the standard settings does not help much: you still have a double set of exposed female RCAs that can attract interferences, oxide etc. A microswitches system with gold contacts would have been simpler, more user-friendly and _perhaps_ (no proven evidence of this statement!) better sounding. Sound. The sonic performance has to be considered proportional to the cost of this unit. Any Audio Analogue fan will find that kind of sound he is used to, for sure! Personally, I'd have preferred more slam and impact, even in the mid range. Sometimes, even a better presence of voices. An injection of "speed" might have helped, too. Anyway, don't get me wrong: I've used a magnifying lens to find and then describe these characteristics. Overall, this unit makes vinyl sound very, very enjoyable, especially during long listening sessions. The Audio Analogue Aria is another brilliant example how sophisticated engineering (cf. off-line PSU) and choices made "by ear" can successfully live together and cooperate. The result is a phono preamp that is undoubtedly "Audio Analogue" sounding, nicely built and offered at a price that's still very interesting, if you consider the level of performance achieved. The Aria proves, once again, that a properly installed vinyl playback system is still very hard to beat. I write these few words having your review of our phono preamplifier Aria in front of me. It's a gorgeous review indeed, for objectivity and utterance, and all of us in Audio Analogue are happy about that. Moreover, it's a rule for us not to discuss a judgment we have accepted. Neverthless, I need to get back to two statements you wrote in the review, that I consider not fulfilling the real spirit of Audio Analogue. I'm embarassed to admit that the reason for this is bad communication from Audio Analogue, but this is another reason to better explain the meaning. Your first statement is about who designed the Aria. It's true, I've worked on the design right all the way to its completion, but I'm just one of the guys who gave their contribution to the design. Audio Analogue relies on a design team formed by more than a dozen people, from engineers to style designers to technicians. Here, a major contribution comes from Claudio Bertini, the person who actually "created" the Audio Analogue sound and gave us the indications for the functional features of the Aria, aimed at getting the most within the budget. During the development, three other people gave their contribution. Thus, I honestly can't say I'm the "father" of the Aria. no need for battery charge circuit: less cost. For these reasons and � why not? � to be different from other manufacturers, we put the battery solution aside after a thorough comparison. I think your readers will enjoy these words. I felt the need to send them to you for completeness' sake. Thank you very much for the room you'll give me and my words, and please: go on this way!